So I know everyone out there has some of their own money saving tips and tricks. I thought I would try to share a few of the ones I use. This idea came to me today while wandering around one of my favorite stores, trying to find items to put in my discount shopping bag. I saw a package of plastic glue spreaders for sale for $3.50 (per 6), I have read of guys using old credit cards and such and I have a few of them in my box but the items I found that seems to work well serves two purposes in finishing. Poly foam brushes, once I am done using them to finish with I let them dry out then strip the foam head off. They generally have a plastic piece to hold the shape of the head which makes great a glue spreader. 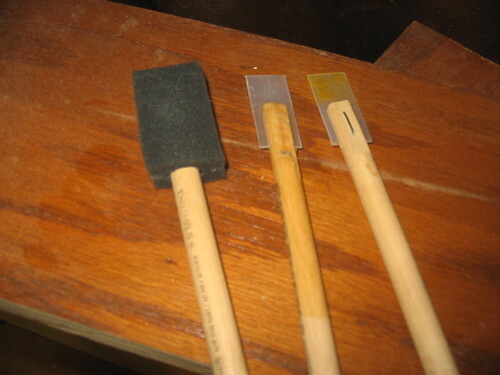 I have also used them as stirrers for my finishes and have started to tape them to the sides of the can once dried so i can use the same one again. The best part is these are usually on sale at various places for like 10 cents each and I get to use them for more then just glue up. Also come in handy as wooden dowel pins. Great tip Chris I’ll remember that one thanks for sharing. You’re a good scavenger! love it. I never knew what to do with those darn things once the head came off… great tip! And I thought I was cheap (frugal?)! Great idea! I use the fake credit cards that I get in the mail, have a stack of them, but two days ago, needed to spread Poly glue (industrial gorilla) over a large surface, and use a piece of scrap wood. Use and reuse. Great tip. Thanks. send that tip in to one of the magazines. that tip is worthy of a prize. your a thinker. An extra tip. Take a pinking shears and trim the end off about a quarter of an inch. This will give you a notched trowel effect. I find it a better way to spread the glue for big glue ups. Thanks all. Hope it is a great help. David, Never really thought of submitting as a tip. But I have now. Worth a try. Gary, thanks for the additional tip. Looks like I may have to go find my wife’s stash of scrapbooking sciscors. Congrats on the magizine tip.